You’ve probably seen initiatives ranging from technology projects to process innovation projects to wider-scope projects. A lot of money, time, and effort was invested in these projects. What have been the outcomes? Positive business outcomes are always expected at the time decisions are made to launch projects. The question is: what have been the actual outcomes? More particularly, did the outcomes contribute to the organization’s corporate strategy? Business outcomes have ranged from the tragic to the strategic. Where in this range would you position your initiatives? To answer, an outcome-focused quadrants chart is helpful. It helps you know where you stand, find out what’s fundamentally and consistently wrong, and then make the needed changes. So, let’s get to work on it. To create outcome quadrants, keep corporate strategy and actual outcomes handy. Actual outcomes: The C-suite wants outcomes to correspond to corporate strategy. Of course, there will be a small percent of exceptions, where initiatives will be nonstrategic and yet needed. Check the outcomes to see whether or not your initiatives made a strategic contribution. Also get an approximate idea of the level or degree of the outcomes. Create a simple quadrants chart similar to a bubble chart. On the chart’s X axis is Strategic Contribution. The range is from None (left) to Strong (right). On the Y axis is Outcomes. The range is from None (bottom) to Strong (top). The four quadrants represent four broad outcomes. Tragic. The bottom-left quadrant is the Tragic quadrant. Place here those projects that generated low levels of business outcomes that were also nonstrategic. Ad hoc. he top-left quadrant is the Ad hoc quadrant. Place here projects that generated significant business outcomes, but those outcomes did not make a strategic contribution. This is the quadrant that can mislead organizations to think that they’re doing fine when in reality they may not be doing fine. The presence of too many initiatives in this quadrant probably indicates that the organization lacks strategy translation capability. Promising. The bottom-right quadrant is the Promising quadrant. Less-than-targeted levels of outcomes were generated, but they made a strategic contribution. Projects you place in this quadrant indicate that the organization is on the right track and can shoot for great performance in upcoming projects. Strategic. The top-right quadrant is the Strategic quadrant. This is where you want to see almost all of your projects. Show your projects as bubbles. You may attach a characteristic (such as project size) to the bubble. If you do, you could vary the bubble size accordingly. It’s important to note that outcome quadrants is not a maturity model in which you start at the Tragic quadrant and go on a journey! You should aim at least for the Promising quadrant. So, the only “journey” here is from Promising to Strategic. Where are your initiatives in the outcome quadrants? 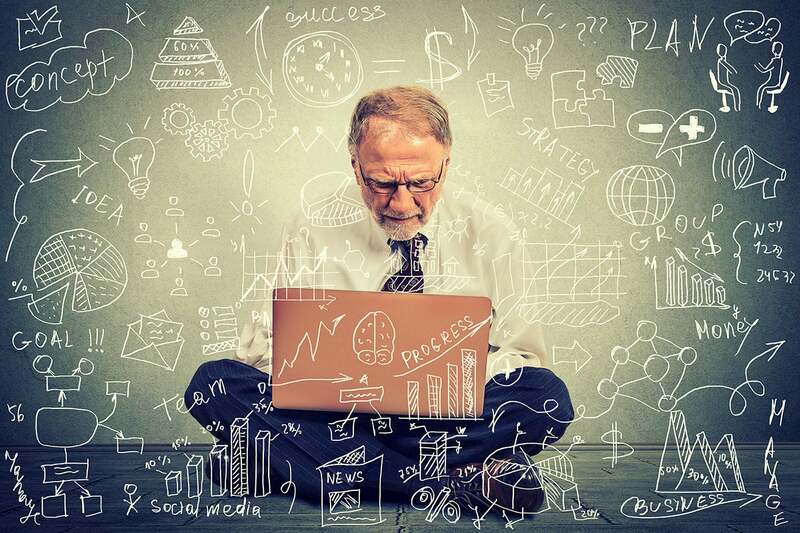 Research reports by firms such as Forrester and personal exposure to hundreds of projects in the last three decades suggest a few things about organizational initiatives. Here’s how initiatives deployed in the IT era performed from a strategic outcome perspective: 25% of the initiatives were in the Tragic quadrant, 50% were ad hoc, 15% promising, and 10% strategic. If this is a reasonably correct picture of reality, note that although only 25% of the initiatives translated corporate strategy into corresponding outcomes (at varying levels), the perception of project success was completely different. A huge 75% of the initiatives must have been perceived by organizations as successful or justified. Being present in the ad hoc quadrant can give a false sense of success, although the quadrant may also accommodate genuinely successful projects executed to address specific problems or requirements such as a new government regulation. Position at least your last three completed projects in the outcome quadrants. What does the classification tell you? 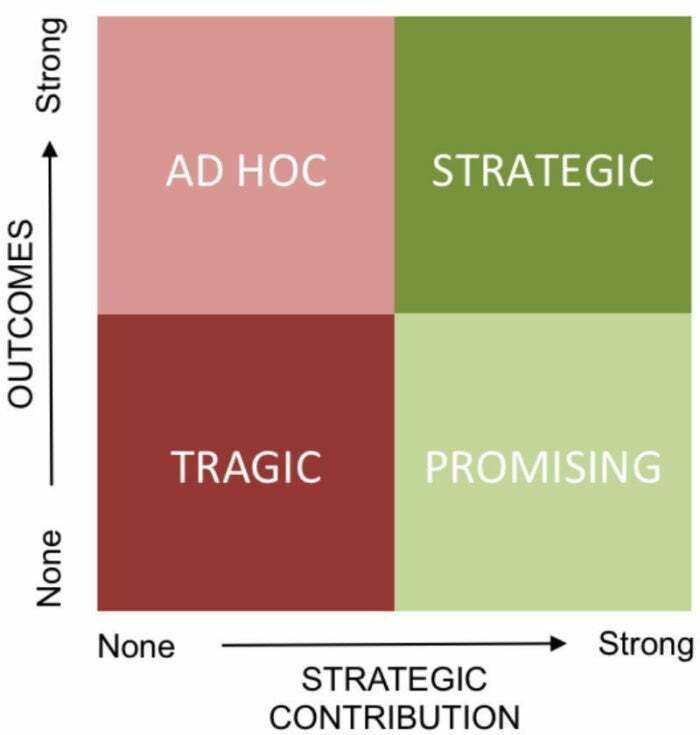 If you have 2 or 3 (out of 3) of your most recent initiatives in the Tragic and/or Ad hoc quadrants, it might suggest that your organization does not have strategy translation capability. In today’s digital era, there’s a change happening that you can see in terms of purpose and scope of initiatives. As a consequence, there is an increasing focus on method. For instance, successful initiatives have taken a strategy-driven approach to combining business and technology innovations. So, here’s a suggested worldview. Strategy creation is done with seriousness. Implementation of technology and implementation of business change are also done with seriousness. There’s one key thing missing: strategy translation. This is where you need to focus. Strategy translation is about doing discovery-and-design to turn corporate strategy into a predictably strategic architecture. Get strong in strategy translation to move your digital-business initiatives into the Strategic quadrant. The success of your career depends on it.